“Mary Poppins Returns” leads with a record 15 nominations for the 2019 LCJ Movie Awards (Sunday February 17th at 7pmET on LCJ Social Media), including Best Picture, Best Director (Rob Marshall) and Best Actress (Emily Blunt). 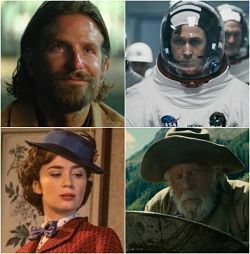 “A Star Is Born” follows with 10 nominations, including dual recognition for Bradley Cooper (Best Director and Best Actor) and Lady Gaga (Best Actress and Best Original Song – “Shallow”). Netflix’s “The Ballad of Buster Scruggs” has received 8 noms, including two for screenwriting and directing duo Joel Coen and Ethan Coen. “First Man” is up for 7 awards, with director Damien Chazelle and actors Ryan Gosling and Claire Foy on the ballot. Nicole Kidman has earned two nominations – Lead Actress for “Destroyer” and Supporting Actress for “Boy Erased”. “Eighth Grade”‘s Elsie Fisher is also a double nominee, in the Young Actor/Actress and Breakthrough Performance categories. HBO Films will receive two special honors for films made for television: “Paterno” and “The Zen Diaries of Garry Shandling”. And, as announced in November, the late Stan Lee will receive the Special Achievement Award: A Lifetime of Cameos, for his incredible impact on cinema. The Nominees in the Best Animated Short Film category will be announced on Monday, February 11th.